Recently we looked at using Keyword Spy to unearth the keywords our competitors were bidding on and other key information such as how long their campaigns had been running. Today we’re going to examine some other online tools that can provide valuable insight into where your competitors are placing their ads along with a slew of other valuable info. We’ll start off with a basic, free option from Google. If you just want to see how your campaign is doing compared to your competitors, you can do this simply from within your Adwords account. You can check performance data for keywords, ad groups, or whole campaigns via stats such as impression share and average position. To use this tool, just sign into your Adwords account, select the relevant campaign, click the keyword tab and choose which keywords you’re interested in (or choose all), and then click on the details tab. This is a good way to start your analysis but will not reveal such items as your competitors’ keywords, bids, quality scores and other such matters. You can find most of this information by searching on Google and seeing what ads appear. A far easier way is to use one of the commercial ad spy packages such as the two below. 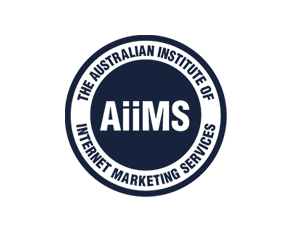 Search marketing is insanely competitive which makes keeping a close eye on your peers vital. Adgooroo offers its market sensing to gain insights into your competitors’ campaigns and marketing strategies. Wouldn’t you like to be alerted when a major competitor kicks off a new product launch or adjusts his PPC budget, or when a new presence enters your market? Adgooroo lets you do all this and more. Other features include competitive spend estimates, measure share of voice, advertiser comparison, ad copy analysis, landing page analysis and custom reporting. They seem to like keeping prices details under wraps but you can apply for a free demo to check out the service. 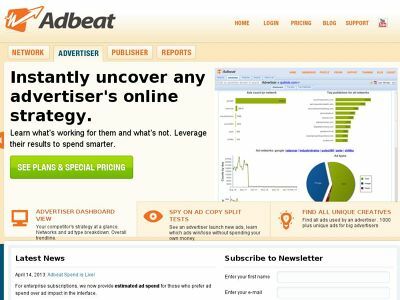 Adbeat makes a big promise – the ability to instantly uncover any advertiser’s online strategy. It does this this through offering an array of tools to lay bare your competitors’ activities in any PPC market. 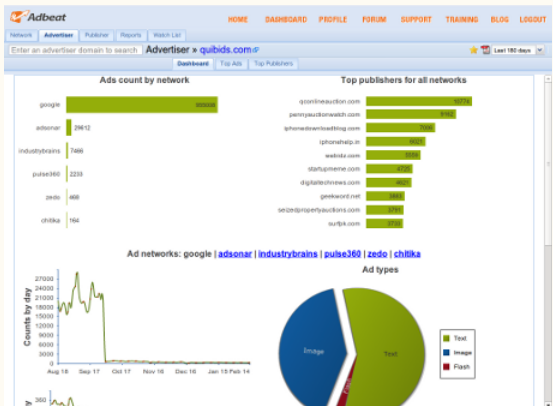 gem is the ability to find which ads have been running the longest and which ads drive the most traffic. You can choose from an introductory package for $99/month but this only covers Google. The professional package at $199/month gives you access to data from a host of networks. For those times when you’re on the move, you can also use the Mobile Competitive Intelligence app, which runs on Android and Apple devices.